The 2nd installment of SMX Advanced has come and gone. I was glad to have been able to be a part of it having missed the first one. In two days I live blogged a total of 8 sessions and attended one additional one that I didn’t live blog. I met up with many old friends and even met some new people. It was also the first trip to Seattle for me although there was little time to actually enjoy the city. All in all, another great conference and a great trip. When not live blogging, I mostly hung out with my good friend Matt McGee who was also gracious enough to take Eric Lander and myself to the top of the Space Needle. This is about the only “touristy” thing I did unless you count a visit to Olympic Sculpture Park where the Microsoft party was held and a visit to the Odyssey Maritime Museum where the SMX After Dark party was held. Other than that, there was little time to see the city. I feel many of the sessions did offer “advanced” information, especially seeing that three of the eight sessions I covered were part of the “Developer’s Track,” which focused on the technical aspects behind SEO friendly programming and web site architecture. 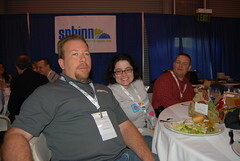 The food served was also phenomenal — a huge upgrade from the typical box lunches served at SES conferences. Three parties offered nightlife and networking opportunities. On Monday, Microsoft hosted a party at Olympic Sculpture Park which included free drinks and bite-sized appetizers and deserts and break dancers (very entertaining). After this party ended we all headed over to bar at the Edgewater hotel. SMX After Dark took place the next evening and was held at Odyssey Maritime Museum. Thanks to Bruce Clay, DoubleClick and Impaqt for sponsoring this event. It also provided me and Jonathan Hochman the opportunity to corner Matt Cutts to which I asked him if Google was going to do anything about Rip Off Report ranking so well in their results despite the fact that many of their “consumer reports” are bogus. I wish he would had told me that they were going to boot them out of the index but unfortunately that was not the response I got. Rather he said it was a difficult problem to deal with. The final party was hosted by SEOmoz at The Garage — a bowling and billiards night club. Eric Lander and myself played Matt McGee and Scott Clark several games of pool, in the end winning 5 of the 7 games we played. 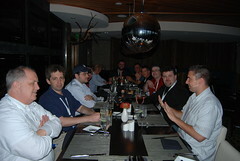 Thanks to SEOmoz for complimentary drinks and food which included some pretty tasty pizza. Matt McGee, Eric Lander, Jordan Kasteler, Tamar Weinberg, Lisa Barone, Rand Fishkin along with several other Mozers, Michael Gray, Todd Friesen, Todd Malicoat, Chris Winfield, Scott Orth, Danny Sullivan, Chris Sherman, Jessica Bowman, Michael Dorausch, Barry Schwartz, Jonathan Hochman, Vanessa Fox, Rob Kerry and probably a few others I am forgetting. It was a pleasure to meet in person for the first time Todd Mintz, Scott Clark, Adam Audette, Andrew Shotland, David Mihm, Martin Bowling and Greg Boser whom I’ve met before but never actually spoke to. Again, I may have forgotten some folks. I apologize. Feel free to ping me and remind me. I will also add names if they come to mind after posting this. Finally, be sure to check out my Flickr Photostream for some pictures of the event. Great meeting you at the show David! See you at the next one. Please send my best to Irma (hopefully she reads it here herself) as I missed seeing her. Great to finally meet you David! It was great seeing you again too, David. Until next time.